The conversion of sections of the former Wandong, Heathcote, Sandhurst Railway into a trail did not happen overnight, yet serious moves to create this rail trail were being made in 1992. With the last train service having ran between Heathcote and Bendigo in 1958 and between Wandong and Heathcote in 1968, an Act of Parliament was passed in April 1975 by the State Government to dismantle this railway line and its associated infrastructure. The former local government councils were then offered the opportunity to own the former railway reserve land in their areas. As a result of the official closure and land offer, the Shire of Strathfieldsaye decided to purchase the section of the railway reserve from the Cemetery Road Axedale to the McIvor Highway Junortoun. One of the reasons for this purchase was the Council’s desire to recover the ballast gravel material from the old railway line, the other reason being a section of the community seeing this as a future conservation corridor and trail. Following that recovery, this land corridor was ‘off the radar’ for Council, until an assessment of publicly owned land (this railway reserve, water race reserves etc) by Shire of Strathfieldsaye Environmental Planning Committee. Sections of the former railway reserve were already being used by the public, as a walking and cycling trail as well as vehicle road sections, prior to this point in time. This committee recommended to Council that the land should be developed into a formal trail and natural reserve. In 1992, the Shire of Strathfieldsaye began investigating options in relation to a use for this former railway reserve. At the Council’s 18th February 1993 meeting, it resolved “That landowners adjoining the former railway reserve be advised that it is Council’s objective that the reserve be developed for the purpose of recreation and nature conservation.” This would be a key date that would create what is believed to be one of the earliest trails on a former railway in Victoria, to be later known as rail trails. In March 1993, adjoining landowners were advised that sections of the former railway that had become unofficial roadways were to be closed to vehicle traffic. Council seeks Government funding to begin converting the land corridor into a trail and natural reserve. Successful funding would see trail work begin on 1st July 1993, under a Federal Government Landcare and Environment Action Program (LEAP) 1993-94 employment programs. On reflection, this development is now known as ‘stage 1’ of the current rail trail’s development. This LEAP scheme initially had 15 unemployed people engaged for 26 weeks on a 10km section of reserve. This work was initially to deal with fencing barriers, provide track improvements, tree planting, identify significant features, and mapping. While this work progressed, sections of the trail were formally available for use by the public as a recreation trail. With the former railway bridge over the Axe Creek missing, this made it difficult for trail users to cross that waterway. The LEAP participants saw this creek crossing as a major impediment for the trail that they were building, and sort to have the installation of a bridge approved. Council agrees on 19th November 1993 to have a low cost suspension bridge built across Axe Creek for the trail. 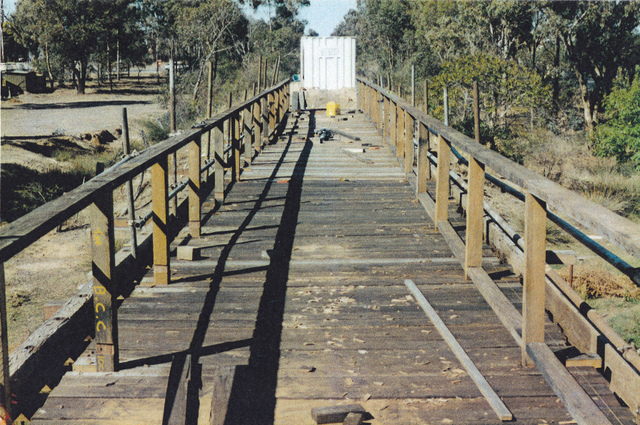 The bridge was designed and construction supervised by Rod Symes a structural engineer with Keleher and Associates, Consulting Engineers, Bendigo. The main support timbers for the suspension bridge were felled in the St Arnaud area by the LEAP participants, dressed, and then transported to site. With donations from local businesses plus support from the Bendigo Army Survey Regiment, the main structure was built in approximately a two week period. The funding for the bridge would be depleted just prior to its final design being implemented, and so the bridge’s approaches were never built. A substitute set of rough timber steps were quickly provided, which would remain as a poor means of access to the bridge for the next 19 years! This Axe Creek suspension bridge was officially opened by Colonel Don Swiney MBE (retired Army Survey Corps Director) at 11:30am on 15th December 1993, with the other sections of the completed trail officially opened the following week, as reported by the Bendigo Advertiser. Local government amalgamations in Victoria in 1994 would see the Shire of Strathfieldsaye and Bendigo City Council being brought together with three other Councils to form the new City of Greater Bendigo Council. The new Council would seek funding for the trail in 1994-95. 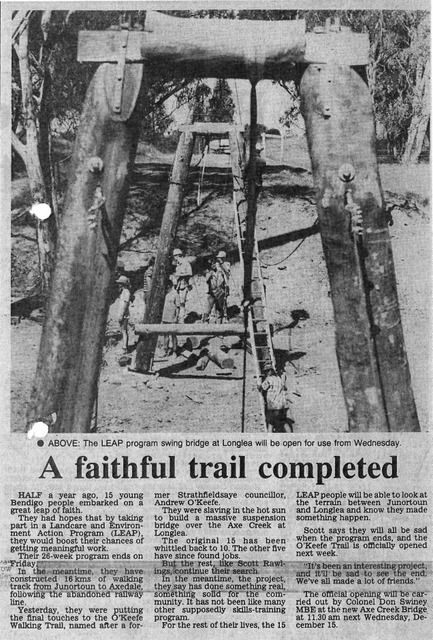 Success through another Federal Government LEAP employment program in 1995-96 would see the construction of an additional 3.2kms of trail plus two replacement bridges, one at Splitters Creek and the other adjacent to the McIvor Highway at Junortoun completed. The trail would now have a continuous length of 13.2kms, between Cemetery Rd Axedale and McIvor Highway at Junortoun, with the City of Greater Bendigo Council as the trail manager. The trail was named the O’Keefe Rail Trail, after the railway line’s Bendigo to Heathcote section original contractor Mr Andrew O’Keefe, who had also been a Strathfieldsaye Shire Councillor. 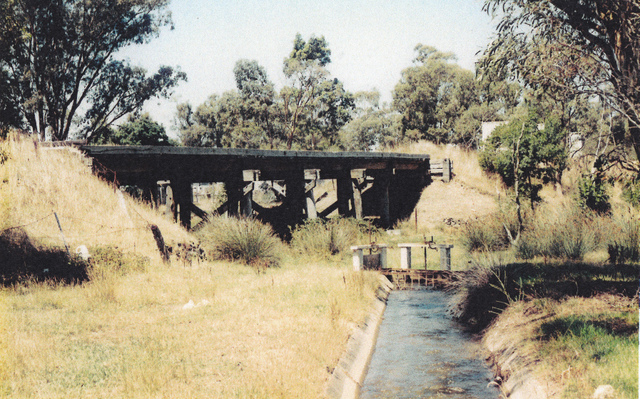 With the last short section of the former railway between North Bendigo and ‘Rangelea’ platform (an Army ammunition storage facility) being booked out of service on 11 December 1986 (due to the condition of the Grassy Flat Creek Bridge located at 160.556 kms point), most of this remaining railway line would be lifted in January and February 1991. The opportunity to extend the O’Keefe Rail Trail from the McIvor Highway Junortoun to the Bendigo suburb of White Hills, on Crown land, was high on the community’s agenda. The O’Keefe Trail Enhancement Committee presented a management plan for the existing trail to Council in 1995. The City of Greater Bendigo Council formed an O’Keefe Rail Trail Advisory Committee, appointed community representatives, and Mr Rob Jarvis a representative from the Department of Natural Resources and Environment in October 1996. The purpose of the Committee was to work with council staff plus a consultant, to develop a master plan for the section of former railway reserve and other land options between the McIvor Highway and Midland Highway. In conjunction with the council, the State Government then contributes $35,000 towards the O’Keefe Rail Trail’s next extension, with additional assistance from the Federal Government’s ‘Work for the Dole’ scheme. This trail’s ‘stage 2‘ extension would be constructed during 1998-99. The trail extension project would also include the refurbishment of the original timber pile railway bridge over the Grassy Flat Creek, beside Strickland Road East Bendigo, trail track construction, plus various signage and road crossing treatments. The official opening of this latest section of the trail was by The Hon. Marie Tehan MLA on the 11 March 1999, approximately 110 years after Andrew O’Keefe’s workers had completed the original railway line in that area. In February 2009, following years of weathering, trail use and minimal maintenance, community concerned then questioned the state of this aging rail trail. Not only had the trail slipped off the radar for most trail users, it also had gaps in the trail due to six missing railway bridges, plus a held view that a new end destination of significance was needed. A core group of individuals came together in February 2009 with mutual concern about the condition of the then O’Keefe Rail Trail, and a vision to upgrade and extend that trail. Work on lobbying various levels of government and individuals started immediately. This group of four (Helen Cronin, Mark Slater, Garry Long, and Ken Hanson) were then to become the steering group in forming the Friends of the Bendigo-Kilmore Rail Trail community group in May 2009. Support grew, with Friends membership increasing following a rail trail public meeting being held in Bendigo. It was envisaged that the proposal at the time for the trail’s upgrade may be achieved within ten years, yet this timeframe was soon to be shattered. Early success, to the surprise and delight of those involved, was due to the cooperation of the City of Greater Bendigo Council and the Victorian State Government being assisted by local political representative Jacinta Allan MP. Joint finding of $3.22M was announced in May 2010, with a significant $1.32M committed by the Council. This joint funding was initially for a four year project, later to be increased to 4.5 years, to upgrade existing and extend the trail from Axedale to Heathcote. Physical progress has been marked by the installation of the six previously missing bridges between Bendigo and Axedale, trail extension and surface upgrading, the replacement of the Axe Creek suspension bridge in 2012, a new bridge over the Hargreaves Creek, and the Campaspe River bridge in 2013. The linking of the new trail section at Axedale to the new Campaspe River trail bridge has been made by the construction of a cycle tunnel under the McIvor Highway in January 2014. The length of the trail in March 2014 was 25kms and growing. The next planning challenge was to cross the Mt Ida Creek and Lake Eppalock inlet, to cover the span of this reservoir’s water catchment area that was the original reason for closing that section of railway line in 1958. This crossing of Lake Eppalock was achieved in late 2014 with a 90m trail bridge over Mt Ida Creek, plus shifting about 90,000 m3 of soil using large earthmoving equipment to form two connecting causeways to this bridge. As well as a new trail being built through part of the Knowsley Forest, between this forest and Heathcote there were five additonal new bridges plus one low level ‘crown unit’ culvert crossing constucted in early 2015. A number of privately owned landholdings now occupied the original railway alignment in the Knowsley and Derrinal area, as well as the management of Lake Eppalock by Goulburn Murray Water. This provided challenges for the project managers, with negotiating land access licences that needed to allow for the use of the land for farming practices such as stock movements and grazing licences. The outcome allow the trail to be located on or close to the original railway alignment, with the installation of a number of cattle grids as one result. A continious trail between Axedale and Heathcote was open to the public on 15 May 2015, allowing full access to this off-road rail trail between Bendigo and Heathcote for the very first time. 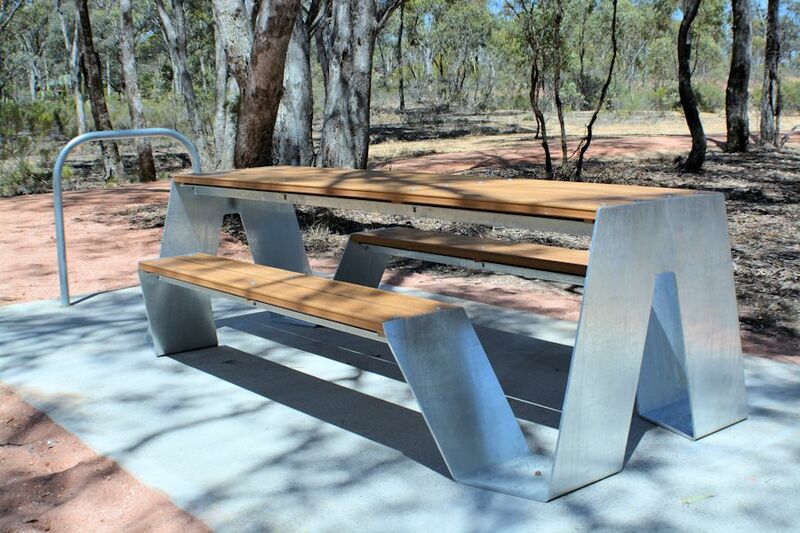 Additional trail facilities such as 14 table and seats, plus 28 bike racks have also been provided at various points along the trail due to efforts of the Friends of the Bendigo-Kilmore Rail Trail, with the funding support of various businesses (Fosterville Gold Mine, Open Infrastructure Austrailia, CVGT Austrailia) and community group grants (Strathfieldsaye District Community Enterprise, Y Service Club of Bendigo, Axedale Our Town Our Future, Lions Club of Heathcote) and City of Greater Bendigo. As well, a number of informative features that include wayfinding signage, information boards and maps have been installed between the Bendigo Creek Trail in North Bendigo and Pink Cliffs Rd Heathcote. Also replica historical features have also been constructed along the trail, by the Friends group, to indicated railway infrastructure that was once part of the railway line. Two representative platforms, replica concrete marker (mile) posts (noting the original railway mile distance points between Heathcote and North Bendigo), every former station has been identified by a replica station name board sign, and a couple of replica telephone poles are some of the historic elements that can now be experienced on the trail. This ‘stage 3’ extension trail project has seen the O’Keefe Rail Trail linking Heathcote with Knowsley, Axedale, and Bendigo as a continious length of 49kms. With both trail heads being located in the middle of recognised wine districts of Heathcote and Bendigo, this will help position the cycle and walking rail trail as one of Victoria’s iconic trails. This latest trail extension was officially opened by Hon Jacinta Allen MP Minister for Transport and Employment, Member for Bendigo East, and Mayor Cr. Rod Fyffe on 21 December in front of 100+ attendees at the O’Keefe Rail Trail shelter area off Herriot St Heathcote. 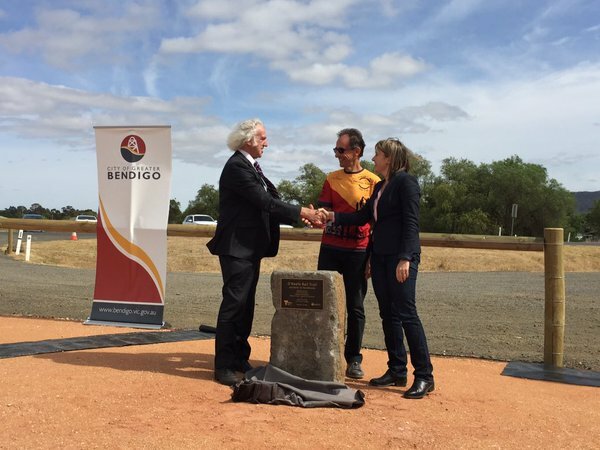 A plaque marking the occasion was unveiled by Minister Allan, Mayor Fyffe, and President of the Friends of the Bendigo-Kilmore Rail Trail, Garry Long. The 2010 -2015 O’Keefe Rail Trail project extension has upgraded the overall quality of this rail trail, a direct constrast to the first low cost budget 10km section that was officially opened in 1993. This 2015 outcome is also being seen by the Friends of the Bendigo-Kilmore Rail Trail and the Mitchell Bicycle User Group as a step towards implementing their longer term vision, the creation of a new ‘Wallan to Heathcote Rail Trail‘ that is envisaged will connect Wallan, Heathcote Junction, Wandong, Kilmore, Pyalong, Tooborac and Heathcote. With 95% of this proposed trail being within the Mitchell Shire area, and 5% in the City of Greater Bendigo area, this proposed trail would become linked to the now completed O’Keefe Rail Trail at Heathcote. It would also have significant tourism potential, being very close to the Melbourne trail network at Craigieburn as well as being close to the Great Victorian Rail Trail at Tallarook. With the State Government commitment of funding a feasibility study plus funding support from the Mitchell Shire and the City of Greater Bendigo Councils, the vision for this new proposed linking trail awaits the outcome of this study in 2016……..and then possible future funding. A future that could have you, friends or family doing an off-road trail ride or walk between Brunswick and Bendigo, Williamstown and Wandong, or perhaps Hawthorn and Heathcote, as an ‘urban escape’ option!! Many will be holding their breath in anticpation! Corrections and additions: Historical corrections and additions are welcomed, and can be made via comments on this page or emailed to us via our contact page.